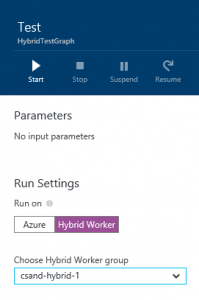 Azure Automation has added the ability to run runbook tests on hybrid runbook workers. Whether you are authoring PowerShell Workflow runbooks or Graphical runbooks, you can now choose to run tests on the runbook workers that Azure Automation provides or on the hybrid runbook workers in your datacenter. Previously, you could run published runbooks on hybrid runbook workers; this release extends the hybrid option to test runbook jobs. An added benefit is that tests often start faster on hybrid runbook workers. Please tell us what you think at the Azure Automation feedback forum.